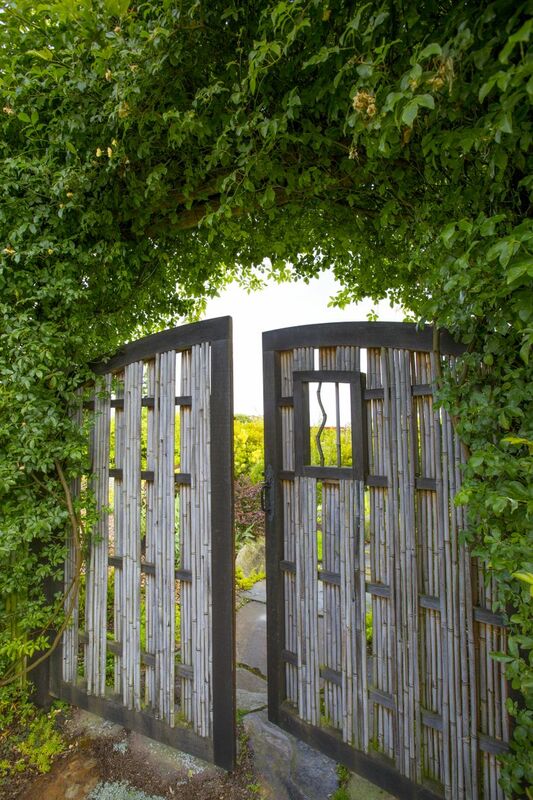 This Edmonds back garden is inspired by the famous labyrinth of France's Chartres Cathedral. 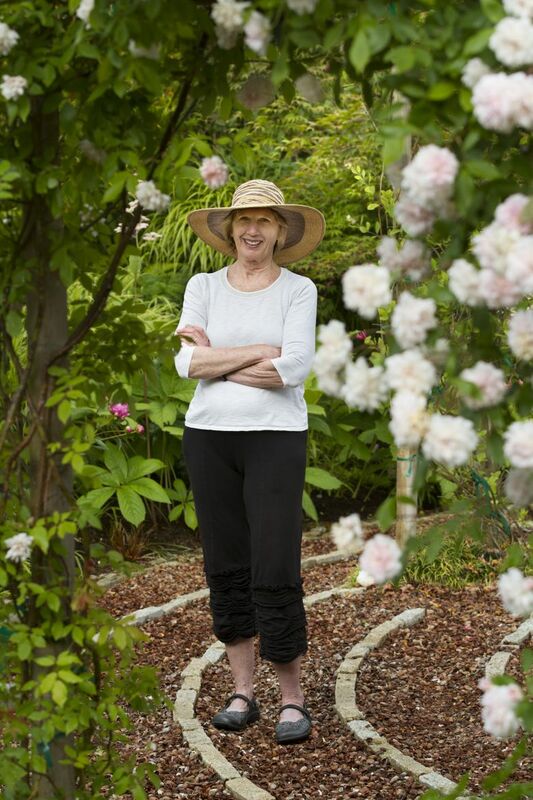 Donna Varnau, a psychotherapist, encourages her clients to walk the labyrinth. DONNA VARNAU fell in love with Chartres Cathedral when she lived in France years ago. 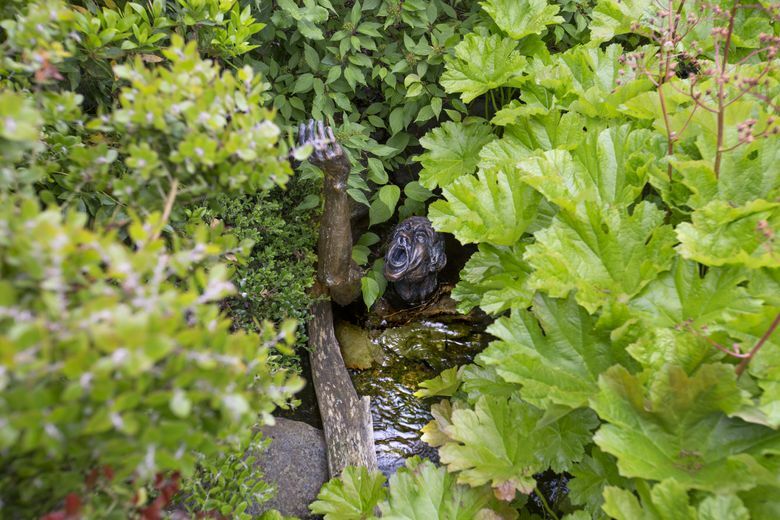 She was so smitten with its famous labyrinth that she replicated its design in the back garden of her Edmonds home. “The Chartres labyrinth is 11 circuits, and this is seven circuits but it feels very much the same,” says Donna, a psychotherapist who encourages her clients to walk the labyrinth. Donna and her husband, David, throw a winter solstice party every year with live music and candles lighting the paths. “It’s not a cocktail party,” says Donna of the event where 60 guests gather to walk together in silence on the darkest night of the year. At the labyrinth’s center is a rosette shape where you can pause to look up through a circular metal portal. 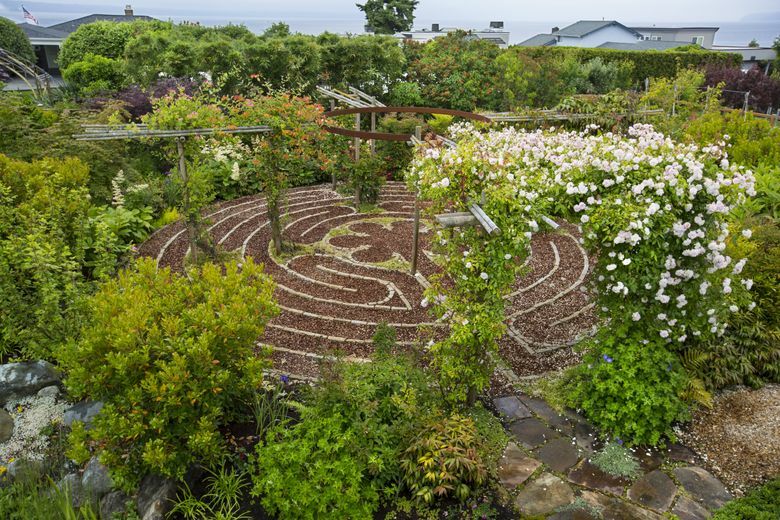 The labyrinth also is a successful organizing principle for this third-of-an-acre garden, an intriguing pattern to look down upon from the deck above, and a relatively low-maintenance way to cover the ground. The labyrinth is floored in hazelnut shells, which crunch pleasantly underfoot and are toxic to weeds. Roses clamber up arbors to form a shady canopy in summer. Varnau points out that a labyrinth is not a maze, for there is a clear route to get in and out. She says research shows that walking its pathways helps integrate both sides of the brain. She’s studied healing labyrinth work with Dr. Lauren Artress, a canon of Grace Cathedral in San Francisco, which has a labyrinth of similar design. When the Varnaus bought the property seven years ago, it was mostly lawn studded with dandelions. Scott dug down, mounded soil and hauled in large stones for topography. He dug a two-pronged stream with little waterfalls for splashing noise. Now a bridge over the stream and a system of pathways wind down and around and through, creating the feeling of a Japanese stroll garden. Scott built raised beds for fruit and vegetables in the sunniest corner of the garden. Here Varnau grows potatoes, garlic, leeks, kale, chard, radishes, snap peas and plenty of basil. With a goal of planting a garden that would grow to be as self-sustaining as possible, Scott used a backbone of Northwest native plants, like evergreen garrya and mahonia. He included manzanita to help California native Varnau feel at home. Over the years, Varnau has planted blueberries and marionberries, dwarf conifers for texture, and vines to climb up the arbors. She added flowering currants and lots of small Japanese maples to flow and weep over the boulders. Hellebores bloom in winter, and rodgersia send up their plumes of pink flowers in springtime. “We have grandkids who love to harvest food from the garden,” says Varnau, who continues to tuck strawberries and blueberries in here and there. The labyrinth remains the heart of the garden, with paths flowing around it to facilitate picking flowers, fruit and vegetables.